The Viking people were farmers, and their choice of food and diet would have really reflected this. The animals kept by the Vikings would have also provided a large portion of their food, as well as the spoils they gained from fishing in the nearby and abundant lakes rivers and oceans in Scandinavia. We know that vegetables would have been common also, certain fruits would have grown well also. Cereals like rye, oats and barley would been used too especially in the creation of bread. One thing we cant really determine about the Vikings is how often and when they would have eaten, but of course we can presume they ate in a similar fashion as we do these days. A factor we do know more about however is how the Vikings cooked and prepared their food. 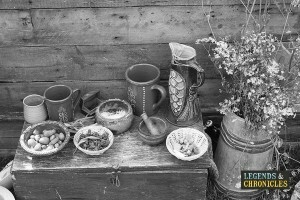 Various utensils, cooking pots and methods have been uncovered through archaeological digs over the years, giving us a valuable insight into the cooking style of the old Norse people. 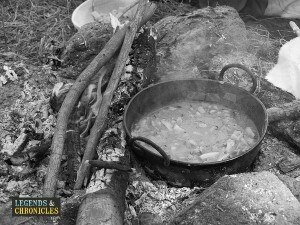 A traditional Viking broth, cooking on an outdoor fire. A varied diet was enjoyed by the Vikings for the most part, the lands of Scandinavia would offer up a plethora of animals, vegetables and fruits making farming a possibility. We are going to explore exactly what the Viking diet consisted of. Keeping livestock was a part of life for many Viking people, Cows, pigs goats, sheep and chicken would have all have provided to their diet. Cows and goats would have been used to provide milk, that would have also been turned into cheese. Chickens would have provided fresh eggs to use in baking and to eat. And all of the animals would have provided plenty of meat that the Vikings could either cook or smoke, or even sell or trade where needed. Wild game animals were hunted also, deers, elk and reindeer would all have been local animals that the Viking men would have hunted with bows and arrows. With the abundance of water, streams, rivers, lakes and oceans, the Viking people ate lots of fish in their diet. Fish such as salmon and trout that live in freshwater were common choices. And sea water fish like cod, herring and even sea fish would have provided valuable additions to their diet. Vegetables were common also, with the Viking farmers cultivating the land and growing an assortment of vegetables. However many of our vegetables today were not yet known to the Norse people, for example potatoes and orange carrots were unheard of by the Viking people. However other vegetables like cabbages, beets, leeks, onions, parsnips, spinach and peas were likely grown by the Viking people. Drinking water in Viking times would have been a risky proposition, without a guaranteed clean water supply there would have been great risk or becoming ill or worse dying. Because of this reason it was common for Viking to drink ale, although the alcoholic content would have been quite low. The Vikings avoided the risk of getting ill by by drinking a brewed ale instead of water, even children would drink it. Of course the ale then was much weaker than it is now, meaning it could be drunk with most meals with relative safety. The brewing of the Viking ale required the most common grain in Norse society, barley which was fermented and then the final flavourings would be added for taste. If ale was the everyday drink for the Viking people, mead was a little more rare and typically used for special occasions. Made from honey from bees, mead was more difficult to make than the ale, and honey was more rare than the grains required for the ale. So for this reason Viking age mead was as we mentioned reserved for the wealthy or rich or for the special occasion and celebrations. Wine was another drink consumed by the Vikings but was not something they made themselves. The main ingredient for wine is of course grapes and these were not naturally occurring in Viking age Scandinavia. However due to the roaring trade culture of the old Norse, wine was imported but would be again reserved fro the wealthy or for very special occasions. A selection of Viking dishes. The Viking had numerous methods they used to cook their food, with plenty of evidence in the form of utensils found to solidly back up this. Certain foods were preserved or dried like fish and meats, allowing it to last much longer than its natural life cycle. When it came to cooking a hearty meal the primary cooking method in old Norse times was to boil it. Cauldron and iron pots were used to cook the meals, hung from the ceilings of their homes, and cooked over the internal fire pits. All kinds of ingredients would be thrown in here, and if the water was not reaching the required temperature, hot stones often heated from a large outside fire pit could be added to the cauldron bringing the temperature back up. Other utensils commonly used were a cooking iron, a flat circular iron sheet on a long arm. This could be used to fry foods or meats quickly and efficiently over the fire pit, Bread could also be cooking using a tool like this. Meet forks and spiral cooking irons were used for similar purposes also. Making the best use of their local resources, the Vikings would provide a range of food for themselves through farming and keeping livestock. The Vikings would have prepared food fresh and kept some cured for the cold winter months. For drinks the Vikings resorted to their daily tipple, Viking ale, which was weak enough that all the family would drink this concoction, ensuring they didn’t catch any illness from the local drinking water. All in all the Viking diet was quite varied, offering a consistently healthy diet, with a mix of fresh vegetables and animal meats.